In this film we focus on three works made by James Turrell and Rachel Whiteread at Houghton Hall. Turrell is an artist primarily using artificial and natural light to explore optical sensations and symbolic associations. At Houghton Turrell has installed one of his luminescent ‘Shallow Space Constructions’ and one of his viewing chambers from the ‘Skylight Series’. Whiteread adopts a process of casting to investigate time, function and memory in ordinary objects and structures. She has made a sculpture by casting a hut on the Houghton estate, part of a new series she calls ‘shy sculptures’ for their modest, utilitarian origins. The cavernous size of the Hayward in ‘brutalist’ concrete lends itself well to that aqueous quality of light that fills a room and becomes tangible when it hits the wall. This is an exhibition that aligns the material of art to its temporary site. The exhibition includes phemenological encounters of the body and eye with more conceptual processes that open up consideration of light’s status and functionality. This primary conversation is established in the first room where we meet Leo Villareal’s ‘Cylinder II’, suspended, multiple strips displaying tiny lights that turn on and off to produce kinetic patterns without any coherence. Villareal’s cylinder resembles high street design by employing computer-generated erratic sequencing. Here technology meets desire. It suggests an ironic comment on an ever-growing demand for ‘conversation pieces’ within the home, but his real interest lies in using software to operate a machine within the gallery. 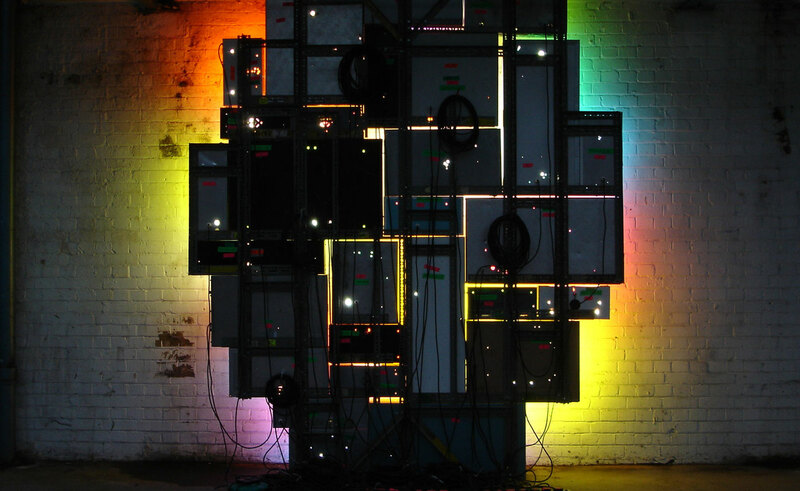 Adjacent is David Batchelor’s ‘Magic Hour’, a series of recycled lighting boxes taken from shops and takeouts. Now the original illuminated message or logo is obscured through reversal. We only see the boxes from the rear with all their electrical anatomy exposed while the deep colours are only visible as projections on the wall only hinting at their origins as commercial messages. These colours are vulgar and clash together on the wall, redolent of city streets and the familiar assault on the eye as shops compete for our pound. Villareal’s achromatic moving points of light is too strategic by comparison, lost in a world of immense technical potential but without much purpose. Perhaps this dystopian quality is the focus but the artist seems too dazzled by his own technical effects. The exhibition is staged as a series of progressions so a work may sit architecturally within a space and is sometimes placed within their own environments. Anthony McCall’s cinematic beam of light is projected within its own darkness and Doug Wheeler’s Plexigas square is described as an object by neon lights which articulate the edges. One stands rather reverentially in the blue haze waiting for enlightenment much like standing before Rothko’s solemn canvases. Wheeler’s work has a pleasing, ambient glow but can’t match Cerith Wyn Evan’s ‘S=u=p=e=r=s=t=r=u=c=t=u=r=e’, a series of three floor to ceiling columns that throb with heat and light. They have an organic quality, illuminating slowly and tentatively so that you can almost hear them breathe. When the light arrives it’s reminiscent of the warm sun touching your face on a winter’s day. A show exploring light wouldn’t be complete without the inclusion of James Turrell or Dan Flavin and the curators suitably oblige. Turrell’s ‘Wedgework V’ delivers all of his stagecraft in setting up illusions modelled out of projected light. Having navigated a pitch-black corridor you enter a ‘viewing’ space with seating from which you observe a ‘sensing’ space consisting of a triangular void given a sense of solidity. We are conscious of witnessing an illusion that toys with certainties of perception. As such is an actionless event and still-life, both ambient and objectified. This is a sensory experience that washes us in sanguinary and sticky colours of the spectrum associated with procreation and regeneration, orange, scarlett and magenta. Returned to the womb, you are encouraged to linger for fifteen minutes. There’s an invigorating rush like having a multivitamin shot. However, this headiness passes and what one remembers is something very aestheticized and fleeting. Turrell’s work feels rather controlling as if we are being compelled to connect with the sublime. Having emerged from the strict parameters of the installation, the visitor leaves with a queasy feeling that the piece is not entirely honest. By contrast, Flavin’s work is directly engaging. Such formal simplicity sits in sharp contrast with Turrell’s box of tricks. Using fluorescent tubes, Flavin made sculpture that openly addresses the ambivalence of light. Without investing them with a predetermined mystery, the naturally enigmatic quality of light is explicit. The austere integrity of minimalism is fully embodied in these works made from bare light strips. ‘The Nominal Three’ makes reference to ‘Ockhams Razor’, a philosophical principle of succinctness. Flavin creates a work that expresses the room’s dimensions and becomes an articulation of physical and numerical facts. The curators have included ‘Untitled (To the Innovator of Wheeling Peachblow)’ which blends colours emanating from a square sitting in the corner in order to match the peachy hue of an historic American glassware. In the rest of the exhibition, there is a range of variable work that examines the properties of light including a lyrical quest in by Katie Paterson’s ‘Lightbulb to Simulate Moonlight’ to capture lifetime’s supply of moonlight. Jenny Holzer quotes a series of disturbing national security documents at dizzying speed across several stacked monitors and Fischli and Weiss satirise our fascination with light by using a small torch to project patterns from a mass produced plastic cup against the wall. Olafur Eliasson transforms water fountains into ice crystals with strobe lights, which has a ‘Willy Wonka’ charm, but quickly becomes impossible to watch and echoes the weakness of many pieces in the show that dabble in the theatricality of light. While it might have been advisable to offer more structure to the exhibition by putting the work in historic context, some of the artworks manage to express those elusive but beguiling qualities of light human beings have always looked for in the natural world and managed to reproduce for practical, spiritual and cultural ends.